A 15-year-old boy who caused the deaths of five people when the stolen car he was driving crashed into a tree has been detained for more than four years. 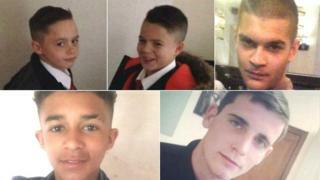 Ellis, 12, and Elliott Thornton-Kimmitt, 14, died in the crash along with Darnell Harte, 15, Anthony Armour and Robbie Meerun, both 24. Leeds Crown Court heard the car “split in two” when it hit a tree in Meanwood, Leeds, at 88mph, on 25 November. The boy admitted five counts of causing death by dangerous driving. West Yorkshire Police said the Renault Clio they were travelling in had been stolen from the Headingley area of the city earlier the same day. The boy, who cannot be named because of his age, was sentenced to four-and-a-half-years detention and disqualified from driving for seven years and three months by Judge Peter Collier QC. The court heard eyewitnesses say the car was being driven erratically and on the wrong side of the road before it crashed. The prosecutor said a passersby who had gone to the aid of the passengers, described seeing the boy fleeing the scene despite being told to wait for police. Speaking at the time of the crash, police said they had been confronted by a scene of “complete carnage”. Two of the passengers were pronounced dead at the site of the crash and three died a short time later in hospital.